A waterslide jump or a rest in the shade of trees? Revelling in the wave pool or relaxing with a refreshing drink? Water aerobics or floating in the slow swim current? Our advice is to try every single thing in the Terme Ptuj Thermal Park! The wide range of waterslides offers something for everyone, from rafts to freefall sections and jumps in the middle section of the waterslide. We have a waterslide for every level of courage! The Olympic-size pool offers plenty of room for swimming, attractive dives from a height of 3 or 5 m, zorbing fun and floating by the edge. When the siren sounds, the wave pool comes into its own. Excited children and their parents leap into battle with waves of all sizes, trying to jump over them and having heaps of fun. There is no better refreshment in the summer sun! The slow swim current is perfect for sunbathing on the water. Find an inflatable ring and relax in the slow-flowing river. You’ll have plenty of time to look around and see what’s going on. Which water attraction will you choose next? So many activities that you’ll need a plan! In the summer, the Thermal Park offers so many activities that you will need to plan carefully in order to try them all during your visit. 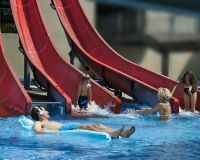 In addition to fun in the water, there are guided activities in and around the pools, recreation on the lawn and relaxing on a lounger in the shade of a tall tree. The indoor Thermal Park has several indoor pools, one outdoor pool and three massage tubs. A special highlight is the waterslide with transparent sections that stays open all year round. Can you imagine what it’s like to have a sauna in a wine barrel? At Terme Ptuj, you can experience it! Treat yourself to some unforgettable water fun! The pools border on a shady park with picnic areas. Take advantage of a free volleyball court, outdoor fitness equipment and mini golf. You can also a ...pply for one-on-one lessons with a swimming instructor.